The tobacco epidemic is an increasing threat to public health with the tobacco burden particularly high in WHO's South-East Asia Region (SEAR). The Region has many obstacles to tobacco control, but despite these challenges, significant progress has been made in many countries. Although much work still needs to be done, SEAR countries have nevertheless implemented strong and often innovative tobacco control measures that can be classified as "best practices," with some setting global precedents. The best practice measures implemented in SEAR include bans on gutka, reducing tobacco imagery in movies, and warning about the dangers of tobacco. In a time of scarce resources, countries in SEAR and elsewhere must ensure that the most effective and cost-efficient measures are implemented. It is hoped that countries can learn from these examples and as appropriate, adapt these measures to their own specific cultural, social and political realities. Tobacco use is widely entrenched in the South-East Asia (SEA) Region leading to high morbidity and mortality in this region. Several studies revealed that tobacco use is widespread among youth and school children. Exposure to second-hand smoke was reported as around 50% or more in three countries - Myanmar (59.5%), Bangladesh (51.3%), and Indonesia (49.6%). Health profession students encompassing medical, dental, nursing and pharmacy disciplines, and even qualified health professionals are no exception from tobacco use. While they are regarded as role models in tobacco cessation programs, their tobacco addiction will carry a negative impact in this endeavour. A mere inquiry about the smoking status of patients and a brief advice by doctors or dentists increases quit rates and prompts those who have not thought about quitting to consider doing so. Evidence from some randomized trials suggests that advice from motivated physicians to their smoking patients could be effective in facilitating cessation of smoking. However, the low detection rate of smokers by many physicians and the small proportion of smokers who routinely receive advice from their physicians to quit have been identified as a matter of concern. This paper describes the role and issues of involvement of health professionals in tobacco control. Data from a variety of sources is used to assess the status. Although there are some differences, tobacco use is widespread among the students and health professional students. Exposure to second hand smoke is also a matter of concern. Tobacco-related problems and tobacco control cut across a vast range of health disciplines. Building alliances among the health professional associations in a vertical way will help synergize efforts, and obtain better outcomes from use of existing resources. Health professional associations in some countries in the SEA region have already taken the initiative to form coalitions at the national level to advance the tobacco control agenda. In Thailand, a Thai Health Professional Alliance against Tobacco, with 17 allies from medical, nursing, traditional medicine, and other health professional organizations, is working in a concerted manner toward promoting tobacco control. Indian Dental Association intervention is another good example. India is the second largest producer and third largest consumer of tobacco. According to GATS India Report (2009-10), the users of only smokeless tobacco (SLT) are more than double than that of smokers. SLT use is an imminent public health problem, which is contributing to high disease burden in India. It is a "unique" tobacco product due to its availability in myriad varieties, easy access, and affordability especially for adolescents. It has been studied to be a gateway product and facilitates initiation. Currently, the Food Safety and Standards Authority of India (FSSAI) have prohibited the use of tobacco and nicotine in any food products; yet, the implementation of a permanent ban on SLT across India is still pending. This paper examines how multiple legislations have failed to effectively control or regulate SLT in India and regionally; thus, there is need to strengthen SLT control efforts as "no ordinary product." Smokeless tobacco (SLT) use is an understudied problem in South-East Asia. Information on SLT use among the adult population was collected from various available sources. SLT use prevalence varies among countries in the region. The prevalence of SLT use is known for all countries at national level in the region with the exception of Bhutan and DPR Korea. For Bhutan, data pertains to Thimphu only. There is no available data on SLT use for DPR Korea. Using all available data from Bhutan, India, Myanmar, Nepal, and Sri Lanka, SLT use was found to be higher among males as compared to females; however, in Bangladesh, Indonesia, and Thailand, SLT use was higher among females as compared to males. Among males, prevalence of SLT use varied from 51.4% in Myanmar to 1.1% in Thailand. Among females, the prevalence of SLT use varied from 27.9% in Bangladesh to 1.9% in Timor-Leste. The prevalence also varies in different parts of countries. For instance, the prevalence of current use of SLT in India ranges from 48.7% in Bihar to 4.5% in Himachal Pradesh. In Thailand, prevalence of current use of tobacco use varies from 0.8% in Bangkok to over 4% in the northern (4.1%) and northeastern (4.7%) region. Among all SLT products, betel quid was the most commonly used product in most countries including Bangladesh (24.3%) and Thailand (1.8%). However, Khaini (11.6%) chewing was practiced most commonly in India. Nearly 5% of the adult population used tobacco as dentifrice in Bangladesh and India. SLT is more commonly used in rural areas and among disadvantaged groups. Questions from standard "Tobacco Questions for Surveys (TQS)" need to be integrated in routine health system surveys in respective countries to obtain standardized tobacco use data at regular intervals that will help in providing trends of SLT use in countries. Smokeless tobacco (SLT) use in various forms is highly prevalent in Myanmar. The aim of this paper is to study the socio-cultural background of SLT use and products of SLT in Myanmar and the prevalence of SLT based on surveys and from other published data bases. Information was obtained from the literature review and through search on PubMed and Google. The use of SLT is deep rooted in Myanmar culture, and there is also wide-spread belief that it is not as dangerous as smoking. SLT use is growing in Myanmar. About 9.8% of the 13-15-year-old school children and 20.8% adults use SLT; it is many-fold higher among men. The use of SLT is prevalent using many different types of tobacco and forms of its use in Myanmar. The socio-cultural acceptance and the myths were compounded by the lack of specific SLT control component in the National Tobacco Control Legislation adopted needs to be addressed as a priority through intensified community awareness programs, public education programs, and advocacy campaigns. Effective enforcement of the law and amendment to include specific components of SLT in the provisions of the law is highly recommended. 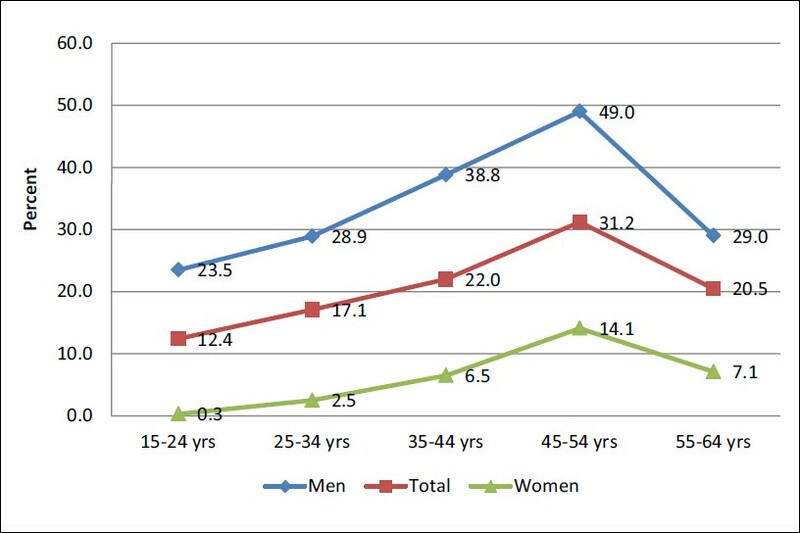 The prevalence of SLT is high among school children and adults (especially in men) in Myanmar. Betel quid and tobacco is a common form of SLT use. Although control of smoking and consumption of tobacco product law exists, its implementation is weak. Tobacco use is widely prevalent in different forms in Nepal. These habits are deeply rooted among different age groups and gender. There is no information available on all aspects of smokeless tobacco (SLT) use and its implications in Nepal. To review the types of SLT products available in Nepal, prevalence of SLT use, correlates of SLT use, SLT-related harm, and existing gaps in information and policy implications. This review is mainly based on information from literature, and some WHO and other documents. The prevalence of smokeless tobacco use is high, particularly among males and disadvantaged groups. SLT users have multiple habits of tobacco chewing, smoking and drinking. Despite SLT products being manufactured in the unorganized sector, they are also largely imported from India. People have easy access to various SLT products. There is a general lack of information on the health hazards of SLT use to the population. This calls for research on the issue. In order to succeed in reducing SLT use in Nepal, addressing the challenges of enforcing the Tobacco Control Act through a multisectoral approach and developing capacity of sectors other than health is of vital importance. To comprehensively review the issues of smokeless tobacco use in Sri Lanka . This review paper is based on a variety of sources including Medline, WHO documents, Ministry of Health and Nutrition, Colombo and from other sources. Results: The prevalence of smokeless tobacco (SLT) use in Sri Lanka has been reported high, especially among rural and disadvantaged groups. Different smokeless tobacco products were not only widely available but also very affordable. An increasing popularity of SLT use among the youth and adolescents is a cause for concern in Sri Lanka. There were evidences of diverse benign, premalignant, and malignant oral diseases due to smokeless tobacco use in the country. The level of awareness about health risks related to the consumption of smokeless tobacco products was low, particularly among the people with low socio-economic status. In Sri Lanka various forms of smokeless tobacco products, some of them imported, are used. At the national level, 15.8% used smokeless tobacco products and its use is three-fold higher among men compared to women. 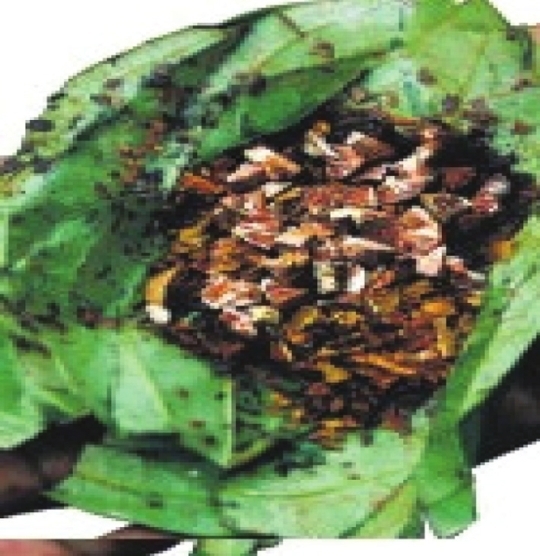 Betel quid is by far the traditional form in which tobacco is a general component. Other manufactured tobacco products include pan parag/pan masala, Mawa, Red tooth powder, Khaini, tobacco powder, and Zarda. Some 8.6% of the youth are current users of smokeless tobacco. There are studies demonstrating the harmful effects of smokeless tobacco use, especially on the oral mucosa, however, the level of awareness of this aspect is low. The highest mean expenditure on betel quid alone in rural areas for those earning Rs. 5,000/month was Rs. 952. The core issue is the easy availability of these products. To combat the smokeless tobacco problem, public health programs need to be intensified and targeted to vulnerable younger age groups. Another vital approach should be to levy higher taxation. The 11 member states of WHO's South-East Asia Region share common factors of high prevalence of tobacco use, practice of several forms of tobacco use, increasing prevalence of tobacco use among the youth and women, link of tobacco use with poverty, and influence of tobacco advertisements in propagating the use of tobacco, especially among young girls and women. The effects of tobacco use are many-fold, leading to high morbidity and mortality rates as well as loss of gross domestic product (GDP) to respective countries. The WHO Regional Office for South-East Asia has been actively involved in curbing this menace essentially by way of assisting member states in implementing the WHO Framework Convention on Tobacco Control (FCTC). This paper gives an overview of these activities and discusses the opportunities and challenges in implementing the FCTC and possible practical solutions. Background: The Medical and Dental Global Health Professions Student Surveys (GHPSS) are surveys based in schools that collect self-administered data from students on the prevalence of tobacco use, exposure to second-hand smoke, and tobacco cessation training, among the third-year medical and dental students. Materials and Methods: Two rounds of medical and dental GHPSS have been conducted in Bangladesh, India, Myanmar, Nepal, Sri Lanka, and Thailand, among the third-year medical and dental students, between 2005 and 2006 and 2009 and 2011. Results: The prevalence of any tobacco use among third-year male and female medical students did not change in Bangladesh, India, and Nepal between 2005 and 2006 and 2009 and 2011; however, it reduced significantly among females in Myanmar (3.3% in 2006 to 1.8% in 2009) and in Sri Lanka (2.5% in 2006 to 0.6% in 2011). 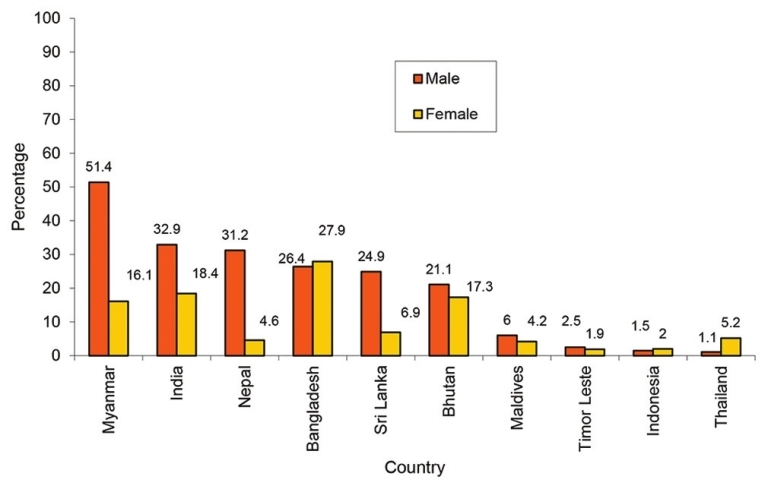 The prevalence of any tobacco use among third-year male dental students did not change in Bangladesh, India, Nepal, and Thailand between 2005 and 2006 and 2009 and 2011; however, in Myanmar, the prevalence increased significantly (35.6% in 2006 to 49.5% in 2009). 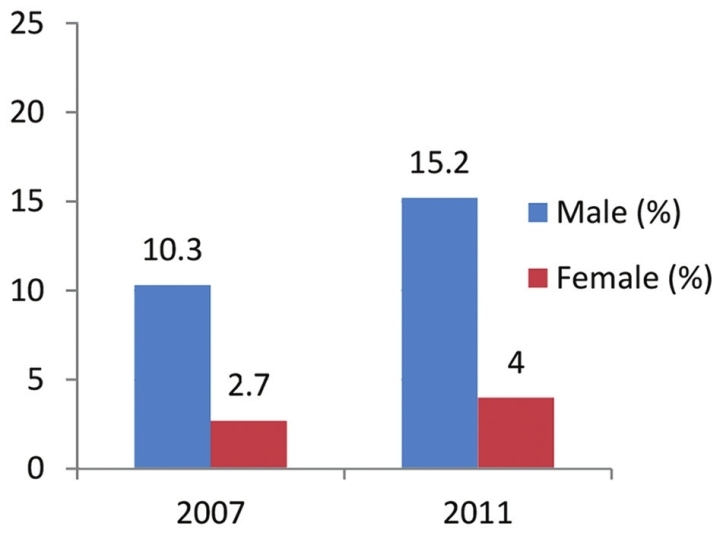 Among the third-year female students, a significant increase in prevalence was noticed in Bangladesh (4.0% in 2005 to 22.2% in 2009) and Thailand (0.7% in 2006 to 2.1% in 2011). It remained unchanged in the other three countries. Prevalence of exposure to second-hand smoke (SHS) both at home and in public places, among medical students, decreased significantly in Myanmar and Sri Lanka between 2006 and 2009 and in 2011. Among dental students, the prevalence of SHS exposure at home reduced significantly in Bangladesh, India, and Myanmar, and in public places in India. However, there was an increase of SHS exposure among dental students in Nepal, both at home and in public places, between 2005 and 2011. Medical students in Myanmar, Nepal, and Sri Lanka reported a declining trend in schools, with a smoking ban policy in place, between 2005 and 2006 and 2009 and 2011, while proportions of dental students reported that schools with a smoking ban policy have increased significantly in Bangladesh and Myanmar. Ever receiving cessation training increased significantly among medical students in Sri Lanka only, whereas, among dental students, it increased in India, Nepal, and Thailand. Conclusion: Trends of tobacco use and exposure to SHS among medical and dental students in most countries of the South-East Asia Region had changed only relatively between the two rounds of GHPSS (2005-2006 and 2009-2011). No significant improvement was observed in the trend in schools with a policy banning smoking in school buildings and clinics. Almost all countries in the SEA Region that participated in GHPSS showed no significant change in ever having received formal training on tobacco cessation among medical and dental students. Introduction: To examine predictors of current tobacco smoking and smokeless tobacco use among the adult population in Bangladesh. Materials and Methods: We used data from the 2009 Global Adult Tobacco Survey (GATS) in Bangladesh consisting of 9,629 adults aged ΃15 years. Differences in and predictors of prevalence for both smoking and smokeless tobacco use were analyzed using selected socioeconomic and demographic characteristics that included gender, age, place of residence, education, occupation, and an index of wealth. Results: The prevalence of smoking is high among males (44.7%, 95% confidence interval [CI]: 42.5-47.0) as compared to females (1.5%, 95% CI: 1.1-2.1), whereas the prevalence of smokeless tobacco is almost similar among both males (26.4%, 95% CI: 24.2-28.6) and females (27.9%, 95% CI: 25.9-30.0). Correlates of current smoking are male gender (odds ratio [OR] = 41.46, CI = 23.8-73.4), and adults in older age (ORs range from 1.99 in 24-35 years age to 5.49 in 55-64 years age), less education (ORs range from 1.47 in less than secondary to 3.25 in no formal education), and lower socioeconomic status (ORs range from 1.56 in high wealth index to 2.48 in lowest wealth index. 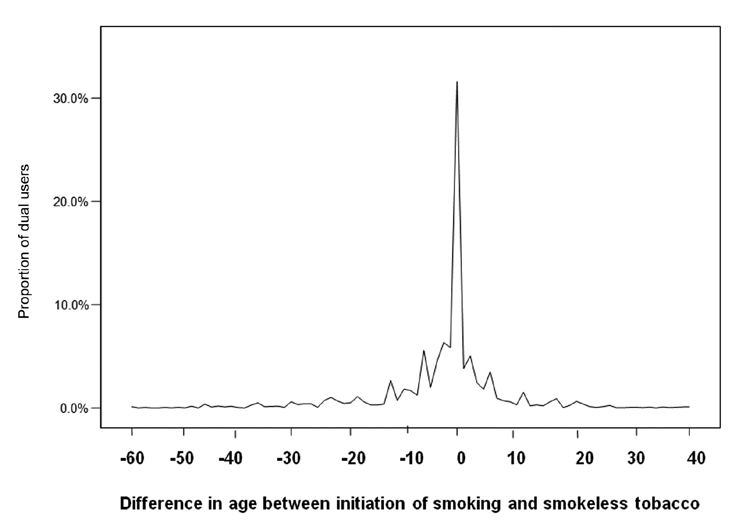 Predictors of smokeless tobacco use are older age (ORs range from 2.54in 24-35 years age to 12.31 in 55-64 years age), less education (ORs range from 1.44 in less than secondary to 2.70 in no formal education), and the low (OR = 1.34, CI = 1.0-1.7) or lowest (OR = 1.43, CI = 1.1-1.9) socioeconomic status. Conclusion: Implementation of tobacco control strategies needs to bring special attention on disadvantaged group and cover all types of tobacco product as outlined in the WHO Framework Convention on Tobacco Control (FCTC) and WHO MPOWER to protect people's health and prevent premature death. Introduction: Individuals who use both smoked and smokeless tobacco products (dual tobacco users) form a special group about which little is known. This group is especially relevant to India, where smokeless tobacco use is very common. The aim of this study was to characterise the profile of dual users, study their pattern of initiation to the second product, their attitudes toward quittingas well as their cessation profile. Methods and Materials: The GATS dataset for India was analyzed using SPSS; . Results: In India, dual tobacco users (42.3 million; 5.3% of all adults; 15.4% of all tobacco users) have a profile similar to that of smokers. Some 52.6% of dual users started both practices within 2 years. The most prevalent product combination was bidi-khaini (1.79%) followed by bidi-gutka (1.50%), cigarette-khaini (1.28%), and cigarette-gutka (1.22%). Among daily users, the correlation between the daily frequencies of the use of each product was very high for most product combinations. While 36.7% of dual users were interested in quitting, only 5.0% of dual users could do so. The prevalence of ex-dual users was 0.4%. Conclusion: Dual users constitute a large, high-risk group that requires special attention. Background: Identifying social disparities in patterns of tobacco use with regard to education, occupation, and gender characteristics can provide valuable insights into the tobacco use patterns of the population. Aim: We assessed social disparities in tobacco use, smoking, and smokeless tobacco use by examining occupation-, education-, and gender-specific patterns. Setting: About 69,030 Indian residents ΃15 years in 29 States and 2 Union Territories (UT). Design: Three-stage sampling in urban areas and two-stage sampling in rural areas for selection of households. Materials and Methods: Data has been derived from GATS 2009-2010, wherein the sample was collected through household interviews. Statistical Analysis: Percentages, proportions, adjusted odds ratios (ORs), and 95% confidence interval (CI) were reported. Results: As a person entered adulthood, the prevalence of ever tobacco use increased by 51.5% among men and 28.8% among women. Prevalence was 2.5 times higher in men (mainly smoking) as compared to women (predominantly smokeless form). ORs for tobacco use were higher among illiterate respondents as compared to the college educated (male OR = 4.23, female OR = 8.15). Unemployed, able to work (male OR = 1.50, female OR = 1.23) showed highest risk, while students (male OR = 0.35, female OR = 0.52) showed the least. The combined effect of occupation and education showed synergistic interaction among females and antagonistic interaction among males. Conclusion: The study clearly underscores the individual and joint effects of education and occupation on tobacco use besides discussing variations based on gender. This can have far-reaching policy implications in addressing disparities in tobacco use. Background: Second-hand smoke (SHS) is a threat to people's health particularly in South-East Region including Myanmar. Aim: To describe the exposure to SHS among the adult population of Myanmar. Materials and Methods: The analysis was done based on the data relating to SHS exposure from 2009 Noncommunicable Risk Factor Survey conducted in Myanmar. A total of 7,429 respondents aged 15-64 from a nationally representative household-based cross-sectional multi-stage probability sample were used. Gender-specific estimates of the proportion of adults exposed to SHS were examined across various socio-demographic characteristics. Results: The exposure to SHS was 55.6% (52% among males and 57.8% among females) at home, 63.6% (71.9% among males and 54.7% among females) in indoor places and 23.3% (38.8% among males and 13.6% among females) in public places. SHS exposure at home was more common among females. However, males were more likely to be exposed at work and public places than females. SHS exposure at home and public places decreased with age in both sexes. In these settings, SHS exposure was related to education, residence, employment status, marital status, and income level. At workplaces, it was mainly related to educational attainment and occupational status. Conclusion: Exposure was significantly high in settings having partial ban as compared with settings having a complete ban. The solution is simple and straightforward, smoke-free environments. The findings emphasize the need for continuing efforts to decrease the exposure and to increase the knowledge of its harmful effects. Background: While no level of exposure to Second-hand smoke (SHS) is free of risk, 37% of students from South-East Asia region were exposed to SHS. Aims: To estimate the prevalence of exposure to SHS and identify predictors of exposure to SHS at home and outside the home among 1,511 school students aged 11-17 years. Setting: The City of Mumbai. Study Design: This study used a two-stage cluster sampling design. Materials and Methods: Mumbai Student Tobacco Survey (MSTS) was a cross-sectional study, using anonymous self-administered structured questionnaire among students. The probability of schools being selected was proportional to the enrolment into grades 8 to 10. The study aimed to sample around 60 students from selected classes in each chosen school. Statistical Analysis: Proportions, 95% confidence interval and adjusted odds ratios (AOR) were used. Results: About 79.9% students were aware about the current smoking ban at public places and 88.1% were knowledgeable about the deleterious influence of SHS on them. Overall, 16.5% of students were exposed to SHS at home, and 39.9% outside of the home. Students from families where at least one parent used tobacco were at the greatest risk of SHS exposure at home in addition to outside the home exposure. Those students who were not aware about the smoking ban in public places were at a significantly higher risk of SHS exposure outside the home. Conclusion: Self-reported tobacco use status, age, parents' tobacco use, close friends' smoking, and the route they take to school were significant determinants of exposure to SHS at home and outside the home. Context: Tobacco use by health professionals reflects the failure of healthcare systems in protecting not only beneficiaries of the system but also those involved in health care delivery. Aim: The aim of this study was to report findings from the Global Health Professions Students Survey (GHPSS) conducted in medical, dental, nursing and pharmacy schools in India. Settings and Design: A cross-sectional survey was conducted in Indian dental and medical schools (in 2009), nursing (in 2007), and pharmacy (in 2008) schools. Materials and Methods: Anonymous, self-administered GHPSS questionnaire covering demographics, tobacco use prevalence, secondhand smoke (SHS) exposure, desire to quit smoking and training received to provide cessation counseling to patients was used. Statistical Analysis: Proportions and prevalence were computed using SUDAAN and SPSS 15.0. Results: Current cigarette smoking and other tobacco use ranged from 3.4-13.4% and 4.5-11.6% respectively, in the four health professional schools, with the highest numbers for medical schools and males. Enforcement of smoking ban in medical schools was low (53%) compared to nursing (86.4%), pharmacy (85.5%), and dental (90.8%) schools. Ninety percent students thought health professionals have a role in giving smoking cessation advice to their patients. Three out of five current smokers wanted to quit. However, one out of two reported receiving help/advice to quit. Although all expressed the need, 29.1-54.8% students received cessation training in their schools. Conclusion: Tobacco control policy, cessation training and initiatives to help students quit smoking should be undertaken. Introduction: Tobacco users face barriers not just in quitting, but also in thinking about quitting. The aim of this study was to understand factors encouraging intention to quit from the 2006 International Tobacco Control Policy (TCP) Evaluation India Pilot Study Survey. Materials and Methods: A total of 764 adult respondents from urban and rural areas of Maharashtra and Bihar were surveyed through face-to-face individual interviews, with a house-to-house approach. Dependent variable was "intention to quit tobacco." Independent variables were demographic variables, peer influence, damage perception, receiving advice to quit, and referral to cessation services by healthcare professionals and exposure to anti-tobacco messages. Logistic regression model was used with odds ratio adjusted for location, age, gender, and marital status for statistical analysis. Results: Of 493 tobacco users, 32.5% intended to quit. More numbers of users who were unaware about their friends' tobacco use intended to quit compared to those who were aware (adjusted OR = 8.06, 95% CI = 4.58-14.19). Higher numbers of users who felt tobacco has damaged their health intended to quit compared to those who did not feel that way (adjusted OR = 5.62, 95% CI = 3.53-8.96). More numbers of users exposed to anti-tobacco messages in newspapers/magazines (adjusted OR = 1.76, 95% CI = 1.02-3.03), restaurants (adjusted OR = 2.47, 95% CI = 1.37-4.46), radio (adjusted OR=4.84, 95% CI = 3.01-7.78), cinema halls (adjusted OR = 9.22, 95% CI = 5.31-15.75), and public transportation (adjusted OR = 10.58, 95% = 5.90-18.98) intended to quit compared to unexposed users. Conclusion: Anti-tobacco messages have positive influence on user's intentions to quit. Introduction: Sri Lanka became a signatory to the WHO Frame Work Convention on Tobacco Control in September 2003, and this was ratified in November 2003. With a view to reduce the use of tobacco in Sri Lanka, the National Authority on Tobacco and Alcohol Act (NATA) No. 27 of 2006 was implemented. Aim: To assess the behavior changes related to tobacco use among adolescents and young adults following exposure to tobacco control measures were implemented by NATA. Materials and Methods: A case-control study was conducted on 42 adolescent (aged 13-19 years) and 156 young adult (aged 20-39 years) men living in Anuradhapura Divisional Secretary area in Sri Lanka. Cases (current quitters) and controls (current smokers) were compared to ascertain the outcome following the exposure to tobacco control measures. A self-administered questionnaire and focus group discussions were used to ascertain the exposure status in cases and controls. Confounding was controlled by stratification and randomization. Univariate analysis was performed by Backward Stepwise (Likelihood Ratio) method. Results: Among 198 respondents, 66 (27.3% adolescents and 72.7% young adults) were quitters, while 132 smokers (18.2% adolescents and 81.8% young adults) were current smokers. Exposure to the anti-smoking media messages revealed that TV was the strongest media that motivated smokers to quit smoking. Majority (66%) of cases and control were not exposed to tobacco promotion advertisements, while 47% of the cases and 50% of the control had never seen tobacco advertisements during community events. All cases (66) as well as 89% (118) of the control had not noticed competitions or prizes sponsored by tobacco industry during last year ( P = 0.13). Conclusion: Tobacco control measures implemented by NATA had a favorable influence on behavior change related to smoking among quitters and current smokers. Background: The Maharashtra government has banned the production, sale, distribution and storage of gutka, and pan masala in the Maharashtra State due to the increasing burden of cancer and reproductive health problems attributable to the use of these products. In view of this, it is important to understand the way producers', sellers' and users' are adapting to the ban. Objective: During the two months following the ban (July 19 th through Sept 30, 2012), a research team studying smokeless tobacco use and promotion in a low income community of Mumbai conducted rapid surveillance to assess the impact of the ban in the study community. Materials and Methods: Assessment involved documenting new points of sale, informal observations of tobacco use, and interviews with thirteen shop owners and eight gutka users'. Overall changes in accessibility, availability, patterns of use of tobacco products, perception of ban, social norms and surveillance activities were assessed. Results: Tobacco companies were marketing new products that resembled gutka, under similar brand logos. Surveillance, financial and social cost of selling gutka or using it in public have had an immediate effect on reducing local supply, demand and use and increasing stigma associated with its use. 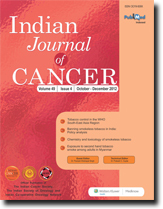 There was an increased recognition of ill-effects of gutka on cancer among sellers' but not overall. Conclusions : To reduce the overall consumption of tobacco in the community, it is critical to include programs that create awareness about effects of smokeless tobacco on health and sustain surveillance levels. This would maintain requirements of the ban, and sustain limits on accessibility, availability and use of these products in the community and other similar communities.